When you move to a new city or country, it's not just a new neighbourhood you need to get to know. Cafes, yes, but also different foods sold in the stores. Moving from Christchurch to Auckland, I discovered Mrs Higgins cookies that became a substitute for the classic Cookie Time cookies from time to time. I usually buy a 1kg pot of unsweetened yoghurt a week in NZ. So far, I haven't been able to find an equivalent alternative in my local grocery store. 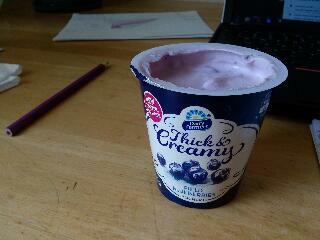 The above Thick and Creamy is my current favourite, in blueberries. Perhaps I should start making my own? !